One of the most influential characters of ancient history is Sargon the Great. He is remembered for conquering the known world and establishing the Semitic Akkadian language as the lingua franca/universal language of the ancient Near East. However the person behind the various legends has remained an enigma. What’s in a name like Sargon? The name Sargon is actually a Biblical translation of an older Akkadian name, Šarru-kinu which translates to “True King.” However the name was used by at least two Assyrian kings from the first and second millennium BCE who chose to legitimize their own rule by identifying with the first Akkadian Sargon who ruled during the third millennium BCE, ca 2270-2215. This throne name, Šarru-kinu, as originally used by Sargon the Great is widely seen as in indication that the so-named king was an usurper. The name’s continued usage has, for many years, confused the actual history of this king. Even in later use the name or title Šarru-kinu was not written in the more standardized Akkadian of the Assyrians, but rather in what is known as “Old Babylonian” which incorporated logograms from the more ancient Sumerian language. The king’s name in the ancient texts is written using the logograms LUGAL.GI.NA. The intent to partake in Sargon the Great’s legacy was so strong that Sargon II, 722 – 705 BCE, continued the use of the nearly extinct logograms to convey his name in exactly the same way as had Sargon the Great 1,500 years earlier. There are several different versions of the text known as the Legend of Sargon. These texts are written as autobiographical narratives where the king Sargon the Great tells his own story. Depending on the version of the text and the translation there is differing information on the identity of Sargon’s parents. One confusion over translation resulted in Sargon’s mother being identified as a “changeling.” Although some translations also list her merely by a description such as “lowly” most historians now recognize that she was an entum, which translates as high-priestess. According to the Legend of Sargon, Sargon’s father was not known to him, although another text gives him the name La’ibum. Sargon does mention his father’s brother(s) who dwelt in the mountains. Additionally his home town is known as Azupiranu which he identifies as situated on the banks of the Euphrates. Although the location of this town has yet to be identified the name is thought to stem from the azupiru herb which was a variety of saffron known to have been harvested in the mountains of northern Mesopotamia. The Sumerian logogram used for the azupiru plant is Ú.HUR.SAG which literally means “mountain plant.” As there are no mountains along the Euphrates in the traditional lands of Sumer and Akkad where Sargon would come to base his empire it can be surmised that Sargon considered northern Syria to be his home. The text relates how Sargon’s mother gave birth to him in secret and placed him in a basket of reeds to set him adrift in the river Euphrates. There was a prohibition on high priestess’s giving birth so the description of Sargon’s mother as “lowly” may refer to her disgrace within the religious community for not properly aborting her pregnancy. As writers of all ages enjoy symbols that imply double meaning it is worth noting that one use for the azupiru plant was as agent for aborting pregnancy. Sargon’s mother took care to seal his basket with bitumen allowing it to float safely. Young Sargon traveled securely until he was recovered by an irrigation worker named Akki who was drawing water from the river. The name Akki appropriately means “to draw forth.” Akki then adopted Sargon as his own son and appointed him as his gardener. The practice of adoption is well documented in ancient texts and it was not uncommon for families to adopt sons in an effort to help guarantee the future of the family business. This appears to have been the case with Akki and the adoption of Sargon. 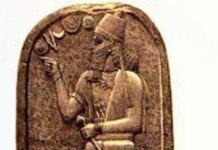 However Sargon would not remain a “gardener” for long as he was to attract the attention of the goddess Ishtar “who loved him.” The support of the goddess Ishtar would propel Sargon onto great things yet the real name and identity of this Akkadian King is likely forever lost to the ages.